Background: After on-scene examination and /or treatment, emergency medical services (EMS) nurses must decide whether the patient requires further assessment or treatment, most frequently in a hospital. 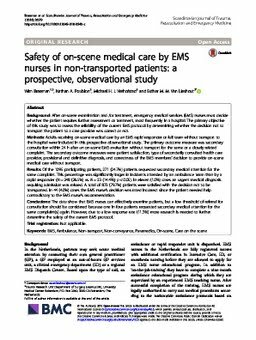 The primary objective of this study was to assess the reliability of the current EMS protocol by determining whether the decision not to transport the patient to a care provider was correct or not. Methods: Adults receiving on-scene medical care by an EMS rapid responder or full team without transport to the hospital were included in this prospective observational study. The primary outcome measure was secondary consultation within 24h after an on-scene EMS evaluation without transport for the same or a closely related complaint. The secondary outcome measures were patient satisfaction, type of secondarily consulted health care provider, provisional and definitive diagnosis, and correctness of the EMS members' decision to provide on-scene medical care without transport. Results: Of the 1095 participating patients, 271 (24.7%) patients requested secondary medical attention for the same complaint. This percentage was significantly larger in incidents attended by an ambulance team than by a rapid responder (N=248 (26.5%) vs. N=23 (14.4%); p<0.05). In eleven (1.0%) cases an urgent medical diagnosis requiring admission was missed. A total of 873 (79.7%) patients were satisfied with the decision not to be transported. In 44 (4.0%) cases the EMS nurse's decision was rated incorrect since the patient needed help contradictory to the EMS nurse's recommendation. Conclusions: The data show that EMS nurses can effectively examine patients, but a low threshold of referral for consultation should be considered because one in four patients requested secondary medical attention for the same complaint(s) again. However, due to a low response rate (11.3%) more research is needed to further determine the safety of the current EMS protocol.